This post is the follow-up to Teaching Children with Autism – The Intangibles. The first part of this post is authored by Christine Hoover. Below Christine’s article, I (Amy Fenton Lee) offer specific examples to illustrate Christine’s points. All of the pictures and ideas shown were created as modifications and enhancements to existing curriculum. 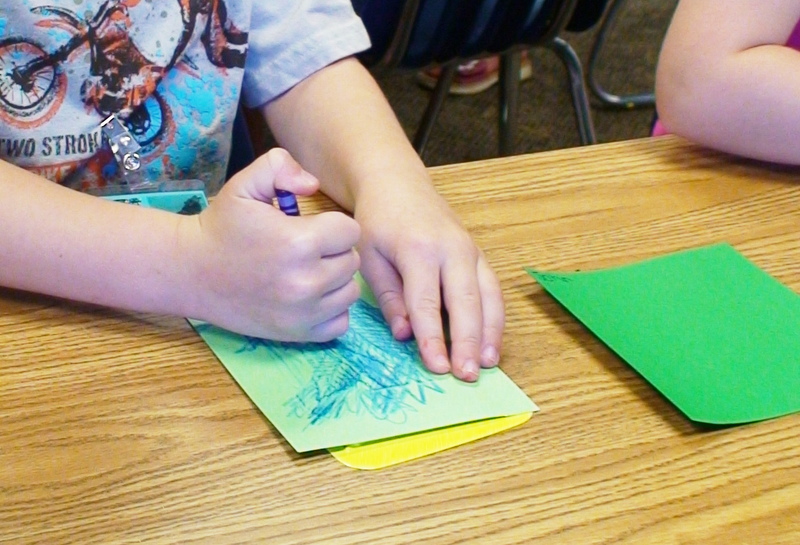 Simple hands-on activities and visual aids are crucial for helping a student with differences connect with a Bible lesson. Structure the classroom. Children with autism thrive on routine and structure. Setting a firm classroom schedule, teaching it to the child, and displaying the schedule in words and pictures will minimize distress. Posting class rules and referring to them often is also helpful for visual learners who need reminders. Children with autism and other special needs may also participate more constructively when prepared for transitions. Giving a transition warning using a musical instrument (e.g. quick shake of a tambourine) is a good way to signal the upcoming need for change. Lastly, keeping noise and chaos to a minimum can be especially important to a child who struggles with self regulation and sensory overload. Oftentimes children misbehave as a way of expressing their desire to leave a “chaotic” environment. Engage the child using his/her interests. Most children with autism have special interests and skills. My son can easily remember anything he’s seen. As a result, my child is especially good at memorizing Bible verses. Oftentimes children with learning differences have strengths and interests that can be channeled for communicating or learning Biblical truths. Use concrete language and visual aids. Abstract concepts are difficult to grasp for most young children, but especially for children with autism. Although the Bible is full of abstract ideas, think creatively about how a story can be taught in concrete terms and through pictures. Cover a clean heart with mud as you talk about sin. Role play (and model) as you talk about honoring parents. Make sure every story has visual aids or pictures to compliment the teaching. Tie the craft to the story and devote craft construction time to re-telling the story as the children are constructing their own creation. Children with autism connect with visual pictures much easier than just sitting in a circle and listening to a story. Christine Hoover is a church pastor’s wife and mother of a son diagnosed with high-functioning autism. For more on Christine Hoover and her writing, see one of the blogs, FindingHopeinAutism or HooverHousehold. 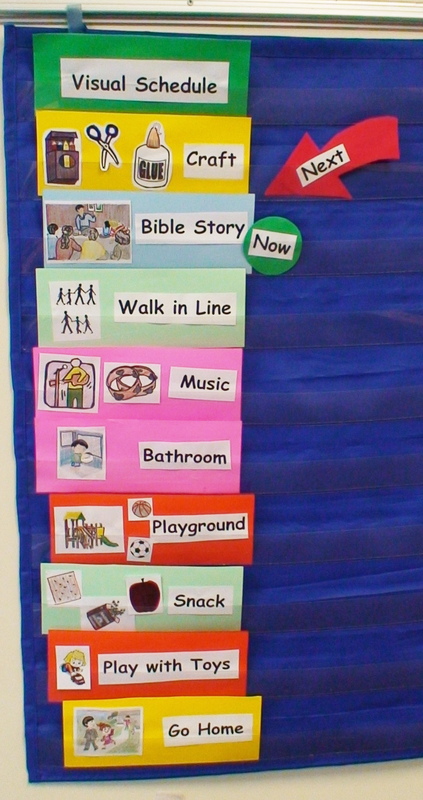 The top picture in this post is of the visual schedule I (Amy Fenton Lee) used in my VBS class this past Summer. To download the art and text shown to make your own visual schedule, click here and download both: “Clip art for visual schedules” and “Text for Visual Schedules“. The below photos and examples are provided to give ideas of how a Bible story can be presented in a way that it engages and connects with a child who requires concrete illustrations. All of these pictures are from my VBS class this past Summer. Children love learning when they get to hold something and take action during a Bible story. 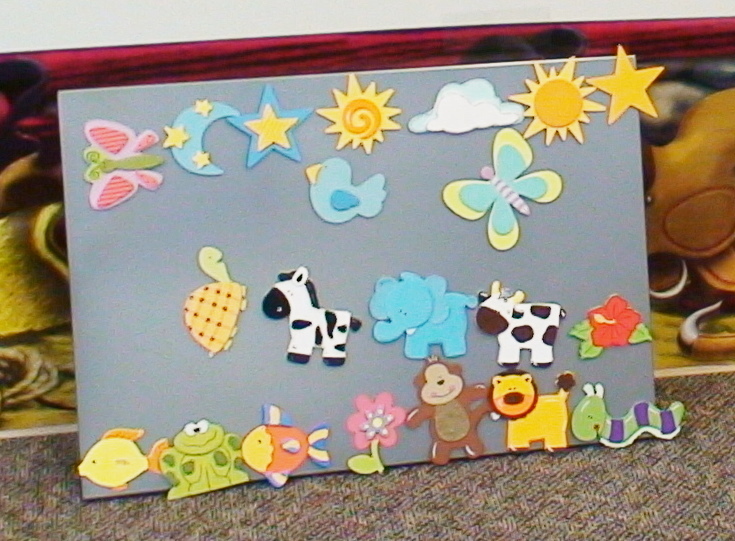 Cutouts and magnet boards are the modern version of the flannel board and quite popular with children. Inexpensive precut and painted cutouts can serve as the three-dimensional figures and can be found at any local hobby store. For this story, I glued magnets to the back of each cutout. Each child selected one cutout representing an item God created and held their chosen item for the duration of the Bible story. During the lesson reinforcement time, the children took turns placing their cutout on the magnet board (obtained from IKEA) to coincide with the day their item was created (e.g. stars were made on day 4, birds were made on day 5, etc.). 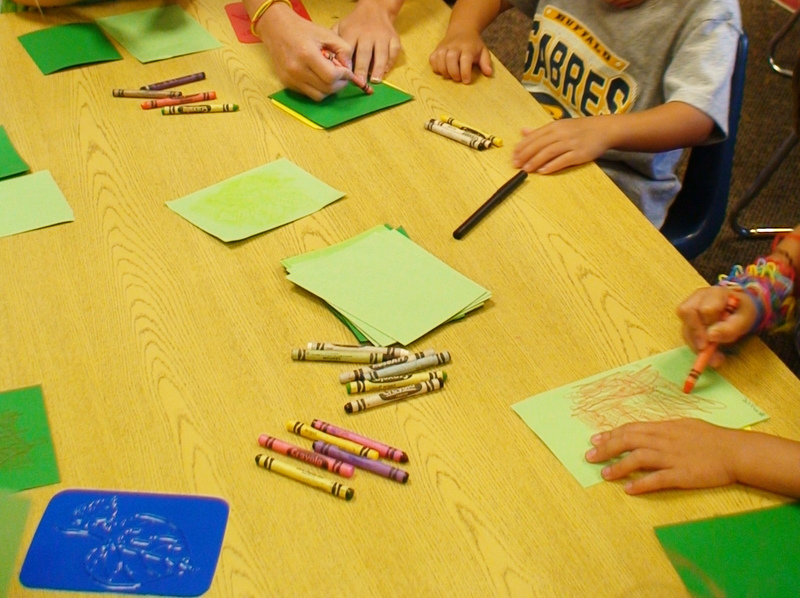 Children often listen when they are busy and constructing an item that relates to the lesson. 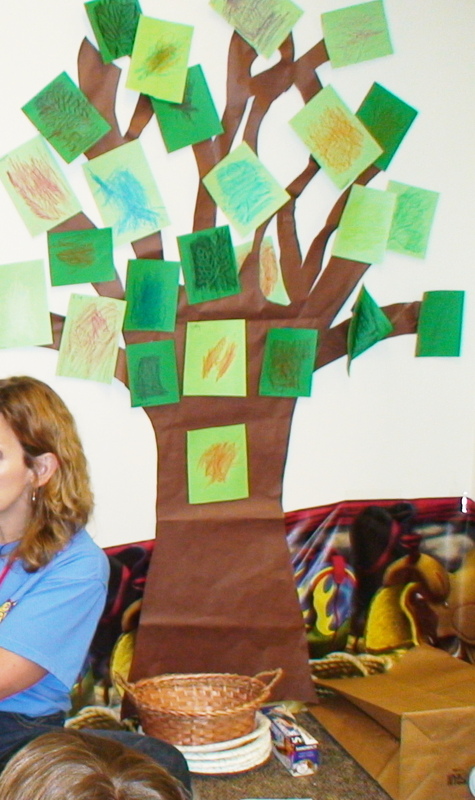 Inexpensive leaf rubs were obtained from a local hobby store and children each created a leaf print as they listened to first part of the Zacchaeus story. Once the children completed their leaf rubs, they brought them to circle time and held their leaf as they listened to the remainder of the Zacchaeus story. The children imagined Zacchaeus’ short stature and his great desire to see Jesus. The students then took turns “building” the tree by placing their leaves, one by one, on the wall. Children listened attentively to the story of Joseph as they decorated their own coats of many colors using glitter and mock oil paint (made with dry tempura powder and dishwashing liquid). When children have an engaging activity that coincides with the Bible content, they remember details and important truths you never thought they heard while they were dipping their paintbrush! During circle time, children were each given a small snack-size bag. 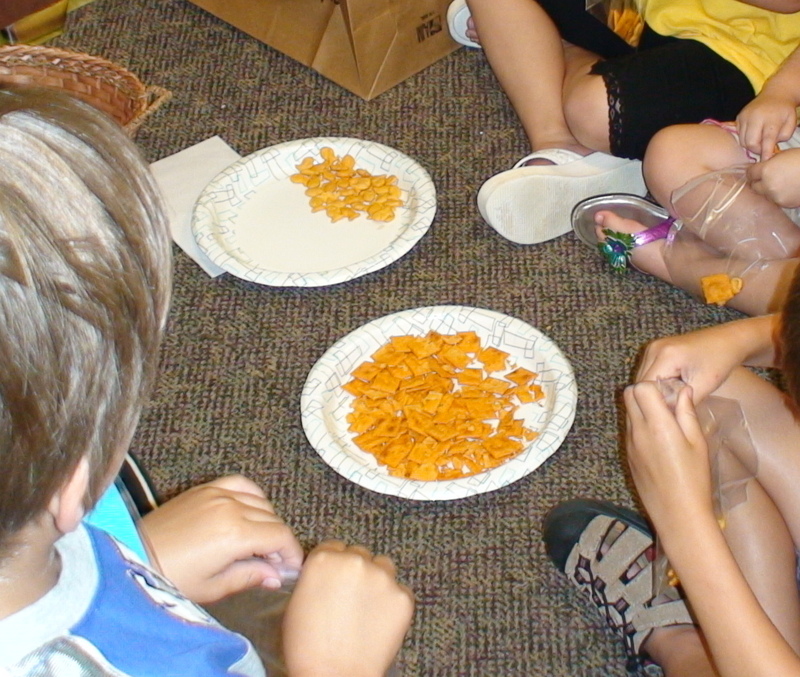 Students then took turns passing paper plates full of “fish” (goldfish) and “bread” (small snack crackers). Each child placed 2 goldfish and 5 crackers into their own snack bag. Their bag represented how much food one young boy had brought to the picnic. Children understood this represented ALL the food available to feed 5000 people. Children visualized the difficulty in feeding the entire classroom with the food contained in their individual size bag. At the end of the lesson 12 paper plates full of food were sat out among the children, representing the 12 baskets of leftover pieces from the story. Children were able to grasp the concept and enormity of the miracle when they compared the 12 paper plates of food to their individual snack bags holding the 2 goldfish and 5 snack crackers. Like this post or any of its content? See Rules for Repost. Brenda – The blue canvas actually isn’t velcro. It has clear pockets that you use to slide in the schedule pieces (paper). I bought that blue thing and am trying to remember where…either at Target (years ago) or IKEA. I’ve actually mislplaced it and have literally turned my house upside down looking for it. I will admit that it was wonderful. If I find it again and if I can figure out who manufactured it – I’ll do a post about it (and email you). I use this visual schedule some in my church teaching (VBS) but I always use it when I teach my workshop on “Teaching Tools & Techniques”…and I recently had to find a way to remake the schedule. I laminated the schedule papers and have used a large magnet board from IKEA. I have found more helpful items from IKEA than just about anywhere! I purchased one of the blue things at a school supply store. So that might be a good place to look! Thanks for the article! Just discovered this. Thank you. I will reference this when I present children’s teacher workshops. I love this blog so much. Thanks so much for this ministry. I founded PALS 15 years ago for my own children with autism (People Assisting Little Souls) in my church and other churches adopted it. I am so blessed when I see churches opening their arms to God’s precious kids and adults as they should.